Autograph Signature of the satirist John Wolcot ('J: Wolcot'), made when 'entirely blind', with autograph note by quaker and radical author Thomas 'Clio' Rickman. 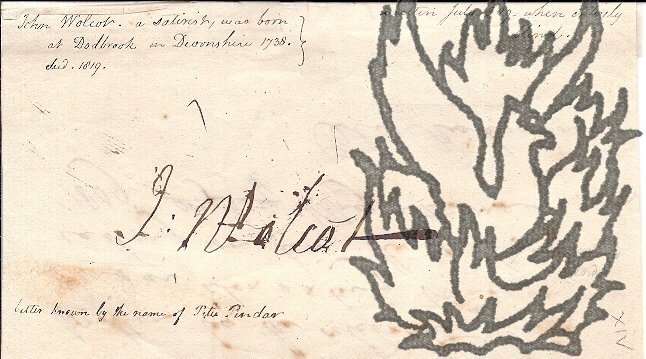 Signature dated by Rickman to 3 July 1809. 12mo, 2 pp, the autograph being on one side and Rickman's on the other. Fair, on aged paper, with traces of previous mounting on one side. Large bold signature 'J: Wolcot' with biographical note on one side, and the note, signed 'Clio Rickman', on the other: Written by the celebrated Peter Pindar, when entirely blind, on my calling on him the 3d of July 1809 my boy with me'.